Big Sugar deeply cares about the political ladder because laws and regulations are a key variable in its profit. Florida's sugar industry uses politics to minimize risk that laws and regulations can lower profits below expectations. Big Sugar calibrates campaign money, including dark pools allowed after the 2010 Citizens United decision by the US Supreme Court, as carefully as it laser-measures its fields, from seeding to harvest, from back bench to committee leadership. It carefully externalizes its costs on the environment, from sulfur magnifying into methyl mercury to phosphorous and nitrogen runoff to cyanobacteria, from ditches into public waterways, from post crop burning to ash plumes to respiratory illnesses in farming communities where frightened residents are too intimidated to complain. In 2012 Big Sugar picked Matt Caldwell from the legislative crowd. Caldwell, a state representative from Lehigh Acres -- one of the areas in southwest Florida hit hardest by rampant speculative construction and the mortgage excesses triggering the great recession of 2007/ 2008 -- successfully executed a US Sugar Corporation strategy to unseat a popular county commissioner in Lee County, Ray Judah. Big Sugar t-boned Judah with dark money. Judah was a lone Republican calling for Big Sugar to fairly shoulder the costs of its pollution caused through fertilizer and additives designed to extract the absolute last penny from crop yields. Caldwell was head of a political committee that launched $1 million of dirty ads in the last weeks of the campaign against Judah. For his success, Caldwell was elevated to Big Sugar's de facto majority whip in the Florida House where, in 2013, he pushed a new law extending to thirty years, Big Sugar's leases on public lands in the Everglades Agricultural Area. 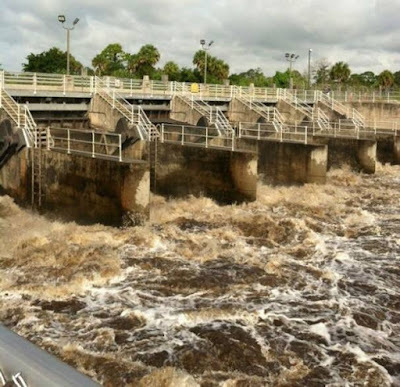 That was the same year as a major toxic algae outbreak in the Caloosahatchee River, a key connector between Lake Okeechobee and Florida's tourism-dependent west coast. At a moment the public clamored to buy more sugar lands for surface water treatment and storage to avoid the mess of downstream toxics waste puking on rivers and private property and small businesses owned by ordinary taxpayers, Caldwell went with Big Sugar. Now he's aiming to replace Adam Putnam who Big Sugar is promoting to Florida governor. Adam Putnam's family farm was purchased by a state agency - the South Florida Water Management District - at five times the appraised value conducted only a year earlier. The Palm Beach Post reported in 2012: "Adam Putnam — former congressman, current commissioner of agriculture and widely viewed as the future of Florida politics — became a very rich man in 2005 when taxpayers spent $25.5 million on 2,042 acres of his family’s ranch that had been valued at $5.5 million a year earlier..."
Putnam ferociously opposed the intervention by the federal US Environmental Protection Agency in establishing state-wide nutrient limits. 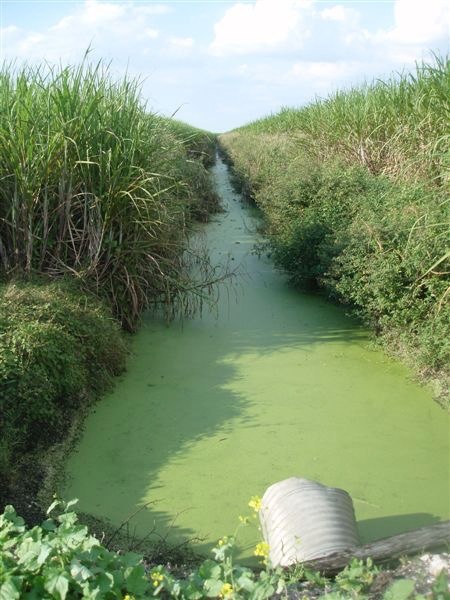 Nutrients being the primary cause of the toxic puke, including vast amounts of legacy pollution when Big Sugar used Lake Okeechobee as its septic tank. Big Sugar has waged a decadal war to boot federal laws from overseeing its pollution. "States rights!" And Rick Scott. Scott came to Tallahassee in 2010 without any prior experience in government. Scott became extraordinarily wealthy through expertise navigating the edges Medicare reimbursement practices. The company he founded, Columbia/ HCA, was hit with the largest Medicare fraud fine ever in 1997. Scott left the company four months after the federal investigation began, but paid no political price for whistling past the HCA graveyard. Which is why, he believes, he can do it again with the toxic mess he substantially helped create. Once in Tallahassee Scott immediately sought to build a political infrastructure. Among those offering a helping hand; the special interest with institutional experience and memory longer than most who served in the legislature: Big Sugar. 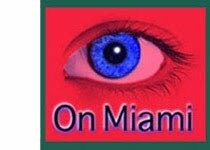 One of Scott's commitments, straight out of the box: terminate a deal consummated by his predecessor, Charlie Crist, to purchase ALL the lands of US Sugar Corporation in the Everglades Agricultural Area. Originally, about 187,000 acres. Because the EAA is highly compartmentalized by ownership (and by design), the US Sugar lands would not of themselves have solved the problem of wetlands treatment marshes on the scale necessary to fix the toxic algae problems. But in aggregate, the lands if they had been purchased by taxpayers even at the enormous costs -- would have been a massive lever to rearrange the Everglades Agricultural Area for the purpose of encouraging a sustainable economic future based on public health instead of sugar cane production. 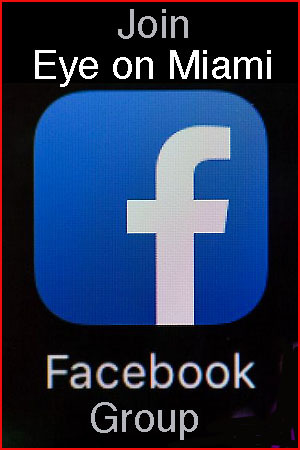 The net effect: rather than pursuing a course that more than 200 qualified scientists believe is necessary -- addition of significant acres of land for water treatment and cleansing marshes -- Scott paved the way towards a 2017 fix that is really a Big Sugar Trojan Horse; a $2 billion "Everglades" reservoir that won't be complete for at least a decade and will likely trigger violations of existing water quality law, imposed on the state by a federal consent agreement after more than a decade of litigation in the 1990's. In other words, Scott killed the real chance to protect Florida's waters, rivers, bays and Everglades and substituted with one that serves Big Sugar's interests. In another early act as governor, Scott gutted the science budget of the South Florida Water Management District. In doing so, he neutered the state capacity to investigate, explain and show the science of pollution of state waters and the linkages between toxics in farming and cities and the Everglades. In effect, Scott made it so that the public couldn't get good information from qualified scientists because he fired them -- most of them. Then he stacked the governing board of the water districts -- his right under state law -- with Sugar-friendly advocates, some of whom delighted in denigrating critics. According to a recent report, "During the seven years under Governor Rick Scott, environmental enforcement has hit a modern nadir, with 2017 registering some of the most anemic results on record, according to a new analysis released today by Public Employees for Environmental Responsibility (PEER). The upshot is that not only is Florida’s environment bearing a greater pollution load, but also its Department of Environmental Protection (DEP) is losing revenue as well as its capacity to monitor--let alone deter--eco-offenses. Apart from the 2017 results in isolation, the Scott record shows a deep, across-the-board nosedive in Number of Cases in virtually every enforcement category." Big Sugar wants to elevate Rick Scott to the US Senate. There is only one risk to its plans for the Toxic Trio -- Scott, Putnam and Caldwell -- that Big Sugar can't control: the weather. And it is the weather, once again, that threatens to force Big Sugar to rebuild its political ladder. Not yet. But maybe. The summer of 2018 is shaping up to be a complete disaster for coastal communities bearing the brunt of highly toxic algae out of Lake Okeechobee. Yesterday, the US Army Corps of Engineers -- the federal partner in charge of the canal infrastructure investment that is built around relieving Lake O water levels when there is too much rain -- held a meeting in Cape Coral, Florida. 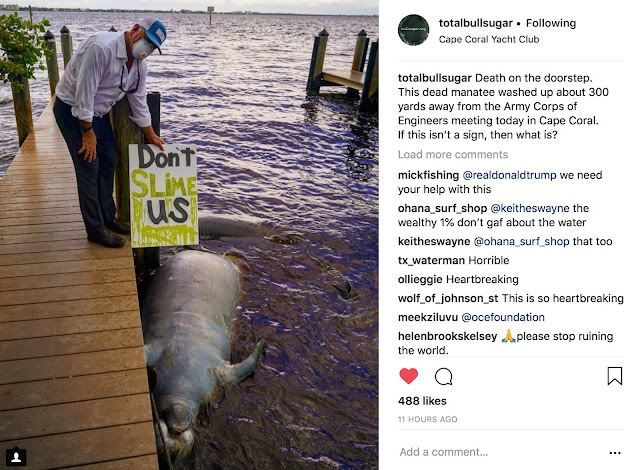 Only a few hundred feet away, a dying manatee clung to the corpse of another; killed by cyanobacteria in the red tide. The Toxic Trio have nothing to say, because everything they have done as elected officials has set in concrete the measures needed to keep science and disclosure of fact at bay. They have closed off options that could save public health, Florida's waters, and a tourism-based economy in favor of sugar industry profits. They don't want the public to know any more than Big Sugar thinks the public needs to know. Go anywhere near cyanobacteria mixed in with red tide, you are at risk of serious neurological disease including links to later-development of Alzheimer's. But Florida won't do the science and won't disclose the data and won't clearly outline the steps necessary to protect public health, because Big Sugar doesn't make money that way. Big Sugar deploys phalanxes of lobbyists, downtown lawyers, and for-hire media professionals so it can continue to extract the last penny from its crop, grown on nearly 400,000 acres, never mind the MILLIONS of Floridians, their families, guests and visitors who put tens of billions into the state economy. Oh, they say, "We are doing MORE than our fair share. We reducing phosphorous hugely!" Rick Scott talks about "jobs". Adam Putnam talks about "jobs". Matt Caldwell talks about "jobs". But they didn't see the weather coming. Just moved to Venice, FL from Cape Cod, MA. Never have I seen a more blatant and corrupt power play than that put together by Big Sugar, Mosaic Mines and the purchased biostitutes at Mote Marine Labs in Sarasota with Rick Scott, Adam Putnam and Matt Caldwell. A vote for any of these three is a vote for selling Florida down the river...or should I say two rivers. 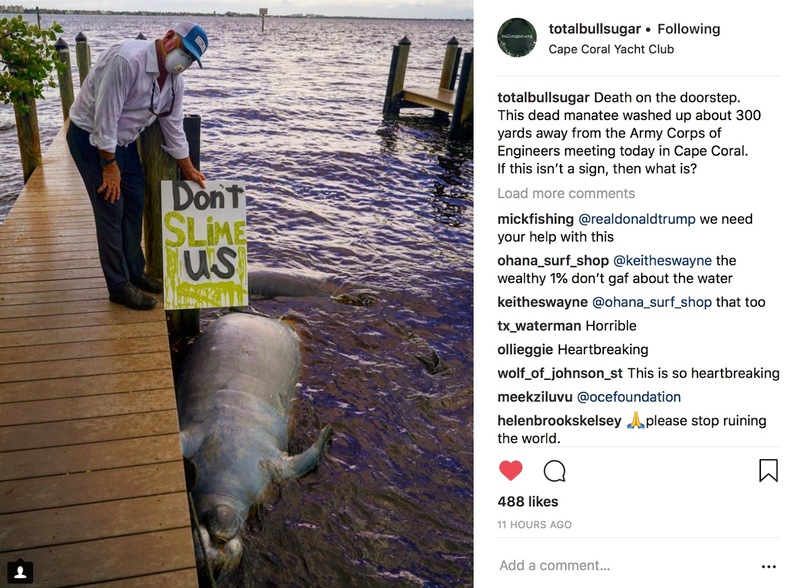 Seeing the video of the surviving manatees pushing their dead friend around in hopes of reviving him was the most pathetic illustration of a corrupt state government from top to bottom. Please get out and vote for people that care about the environment. We need to keep Nelson in the senate and get a Democrat in for governor. Please do not vote for more people that are bought by big sugar. When I go to Publix, I do not see products with the name “Big Sugar”. I do see labels with “Dominos” and Florida Crystals. Don’t let them hide behind a vague pseudo name. Arm consumers, restaurants, bakeries with good info to use when making purchases. 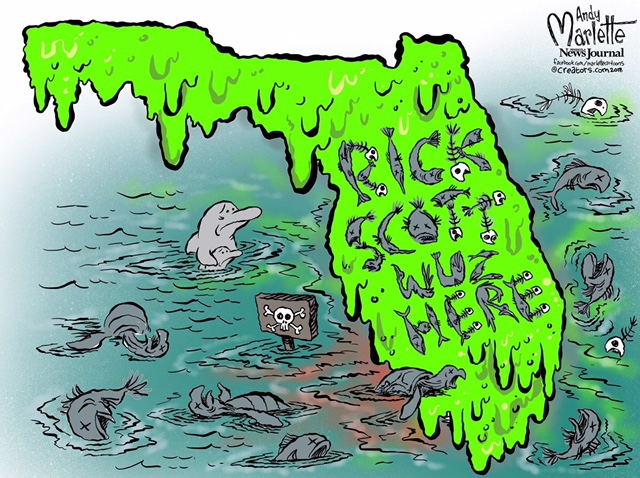 and wound up here "Rick Scott, Adam Putnam, and Matt Caldwell: Turbulent Waters For Florida's Toxic Trio ... by gimleteye". In my book Scott, Putnam and Caldwell are out and I’m a Republican. Informative article and I would love too see more of the officials who are running are state who put money and their own personal interests before the health of our people and our land! Now that it's over, the bad news. Putnam lost the primary for one reason: Trump's endorsement of DeSantis, not because of his allegiance to Big Sugar. Survey after survey ranked health care and the economy as the prime issue (perhaps pollsters did not include environment in the questioning). Worst of all, the chief instigator of our current mess (through his reduction of environmental regulations, destruction of the science staff at the WMD's replacing them with aligned lawyers, DEP, etc.) Rick Scott was rewarded by handily winning each of the most affected Florida counties. Scott's margins in Martin, Collier, Lee, Sarasota, Manatee and Charlotte counties make it clear that Republicans will vote for Republicans, even if with Scott's record. Will Desantis actually stand up to his own party? Not likely. The first thing to be done will be to undo most of Scott's policies. How can any resident of Florida support a climate denier? Apparently a majority had no problem.